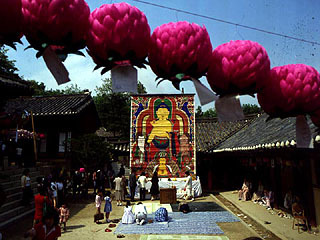 Hwagyesa Temple was founded by Master Shinwol in 1523, during the reign of King Chungjong of the Choson Dynasty. It was burnt down in 1618, and was rebuilt the following year by Master Dowol. For the next 240 years, the temple became so dilapidated that two monks, Yongso and Pomun, had it repaired in 1866. The statues of Bodhisattva Kstitigarbha and the ten judges in the Judgment Hall are especially famous. Beautifully carved by Master Naong in the late Koryo Dynasty, the figures were brought to Hwagyesa Temple in 1877 by Queen Mother Cho. After that, the temple served the royal family. There are two famous urns on both sides of the main hall. They were donated by the queen consort of King Honjong(r.1834-1849). 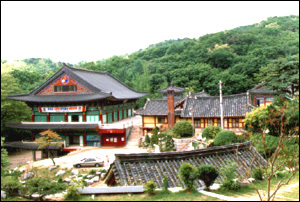 Hwagyesa Temple is home to the Seoul International Zen Center under the direction of Priest Sung-san. Foreign monks and lay people live and practice here.